Please note this unit now has RJ11 phone connections (so you will need adapters or suitable cable if you intend to plug into a BT socket). Unit received may be branded Line Wizard or Xtraline depending on stock levels. A European version is also available with RJ11 connectors suitable for Europe and Southern Ireland. The advanced Line Wizard with improved circuitry and diagnostic lights is also available. 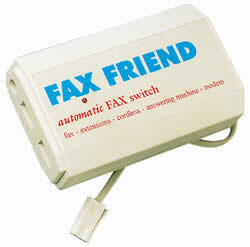 Please see link below on how the Fax Friend works. Fax Friend will work with ADSL Broadband. If you need help, here is a typical setup. For trade enquiries, please email. European dealers and distributors wanted.